Green haze met my eyes. I strained them forward past the cage but saw nothing. The visibility was horrendous. I turned my gaze down but couldn’t see past my knees below me. Nothing in front. The muffled sounds of cheering came from the boat above. One by one we surfaced. I turned to my boyfriend, I didn’t see anything. Did you? Dave shook his head. No. Apparently a shark had passed two feet in front of the cage. 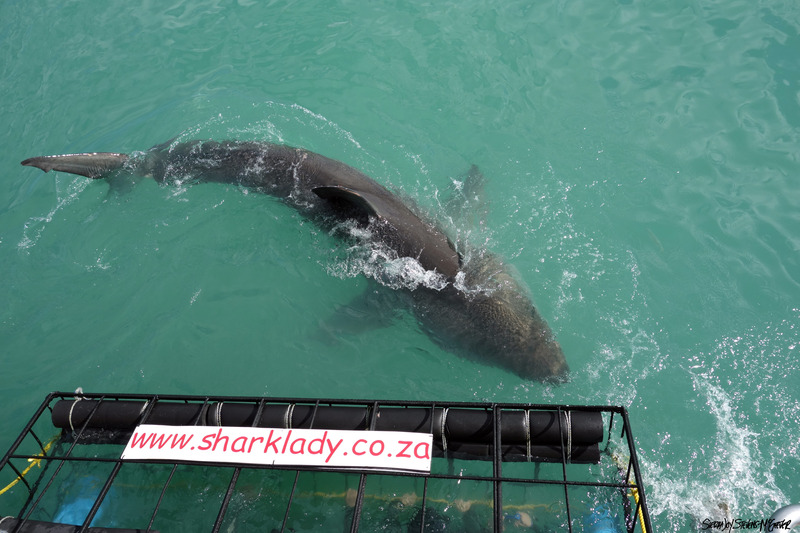 That morning the Shark Lady headed out from Gansbaai, pushing though the cresting surf and out onto the broad bay. An onslaught of raging big waves had torn at the shores all weekend long, and the swell was still up, preventing us from making it out to the usual viewing areas at Dyer Island and Shark Alley. Instead, we anchored in Shark Bay, and began the wait. 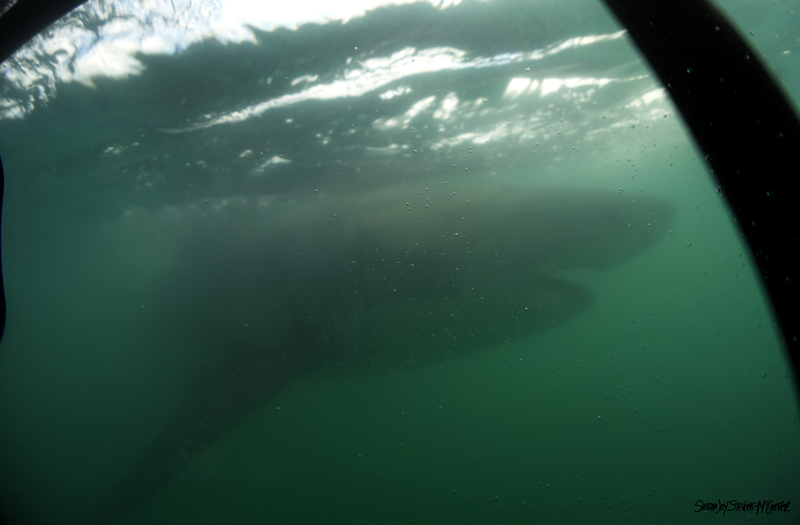 After a half hour or so rocking up and down with the jumbled waves, the crew told us the first shark was around. We got ready. Lance, our shark man, threw a tuna head out on a rope to lure the shark closer. A gray shadow emerged from the depths, its outline growing clearer and darker as it came to the surface. A beautiful creature, ten feet long swam by the boat, just as graceful as the familiar reef sharks I had seen so many times, but so much bigger. 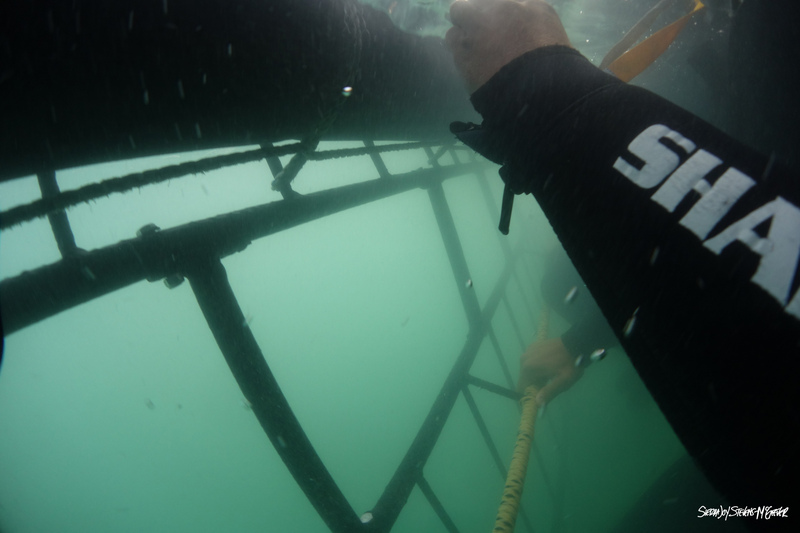 I eagerly volunteered us to be in the first group of divers, so we had suited up and climbed into the cage—2.5ft wide, 7ft tall and 8ft long. We were instructed to hold onto the inside bars and not stick our extremities outside. I expected to be nervous but only found anticipation running through me. But after the first pass and the realization that we were anchored in a murky bay all the excitement drained, my heart sank a little. The couple next to us asked to get out, already shaking from the cold and looking slightly green. Two eager patrons replaced the couple. I wasn’t getting out. I was determined to see a shark. But after 20 minutes and many invisible shark approaches, I still hadn’t even seen a shadow. Divers be ready. Go down. The ocean’s frigid water seeped in at the edges of my neoprene hood and trickled down my back. White hands wrapped tightly on the bar, my eyes strained into the green in front of me diligently seeking a figure in the murky water. Nothing. My lungs began to talk. I swallowed to suppress the need to breathe and stared with purpose into the water beyond. Still nothing. Full body shivers finally convinced me to leave the water and head for the top viewing deck. The boat wobbled excitedly as the seas undulated in multiple directions at once. A great swell rolled the boat. Six passengers sat hunched over the front, green and vomiting—an illustrative reminder to sporadically keep an eye on the horizon. The Great White Shark is perhaps the most famous and feared marine animal. Even its name demonstrates humanity’s awe for it. In the scientific world it is Carcharodon carcharias, or more simply the white shark, but for the masses it is the Great White Shark, and for good reason. The white shark is the largest predatory fish in the sea and even has a sixth sense. Sadly, white sharks have been depicted by the media as mindless, ruthless killing machines and are vastly misunderstood. Ironically, these highly intelligent creatures that we fear so much, are now endangered because of us. 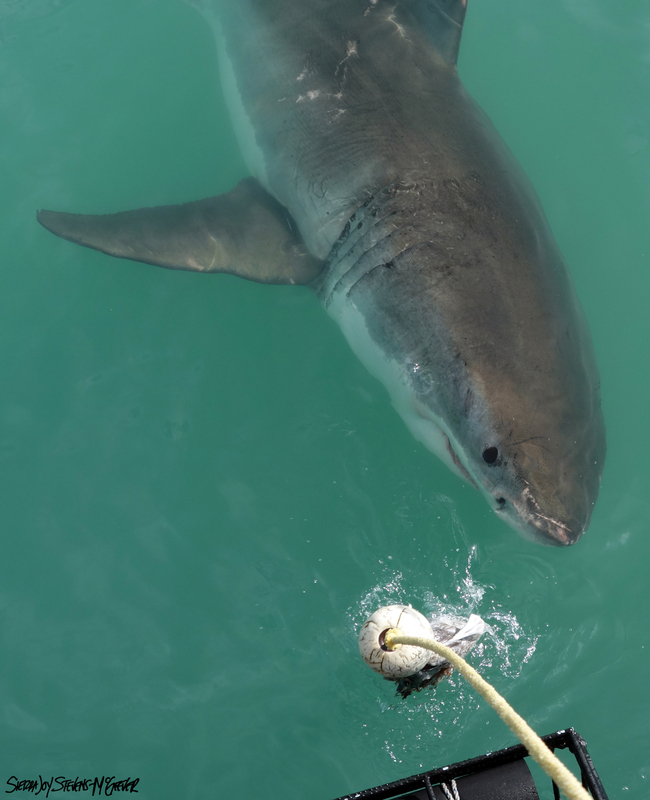 Resulting from intentional slaughter and lethal bycatch in fishing gear, white shark populations have declined worldwide, and are down to 30% in some areas. White sharks have long life spans, reaching over 70 years in age, which makes them poor candidates for rapid recovery. Ocean conservationists all over the world are trying to change misconceptions and protect these magnificent creatures. 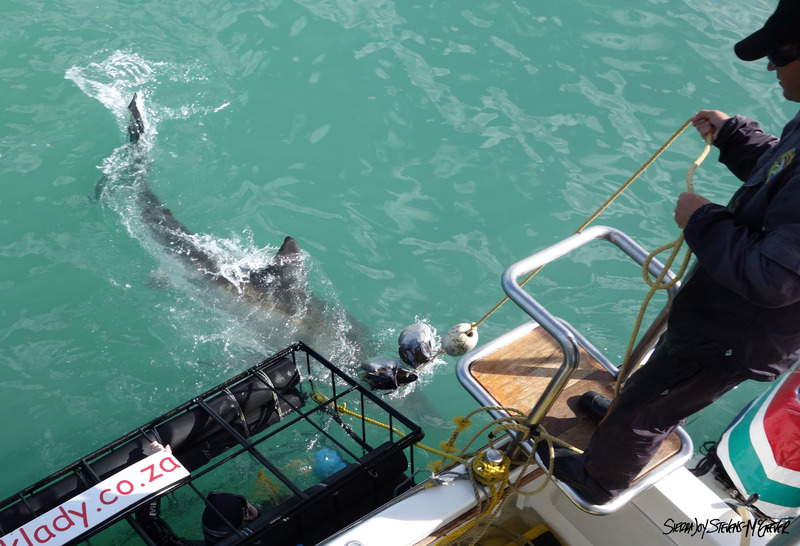 Cage diving boats play their part in this fight by giving people the opportunity to meet these great predators face to face, and learn about them. Dave was pulled out of the cage and the next group went in, a middle aged couple and three British women looking to be in their late 30s. They slid in, but before Lance could close the top, a panicked voiced cried out, I don’t like this! I want out! Lance calmly replied, Are you sure you don’t want to try? It was clear she did not. He reached in a strong arm and offered her his weathered hand. I want out too! Although I felt no uneasiness or fear in the water, I could sympathize: the cage was small, water cold and the visibility left you with a tight, claustrophobic window into the murk. A 14ft male monster swam up, grabbed the bait and took it under. Lance lost his tuna head. It was beautiful watching the sharks from above. We saw 11 in total and at one point we could see three off from the boat in different directions. 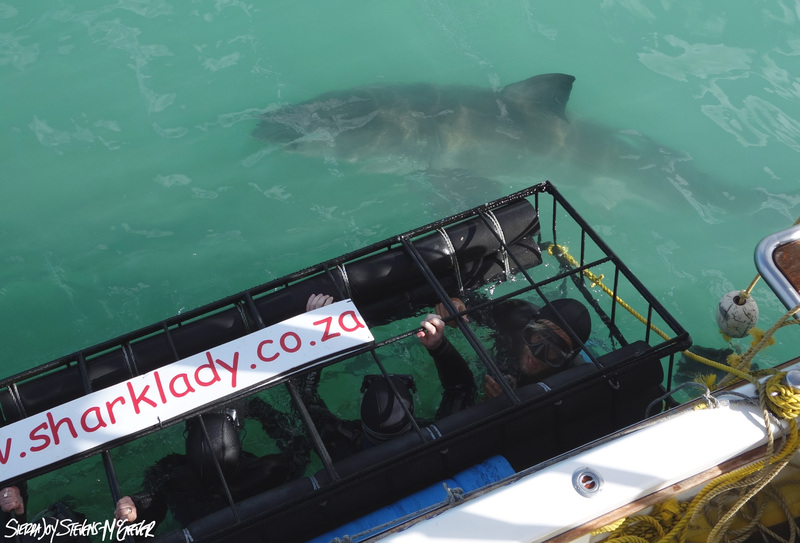 The activity intensified and all the divers were seeing sharks. I decided to jump back in and try my luck again. 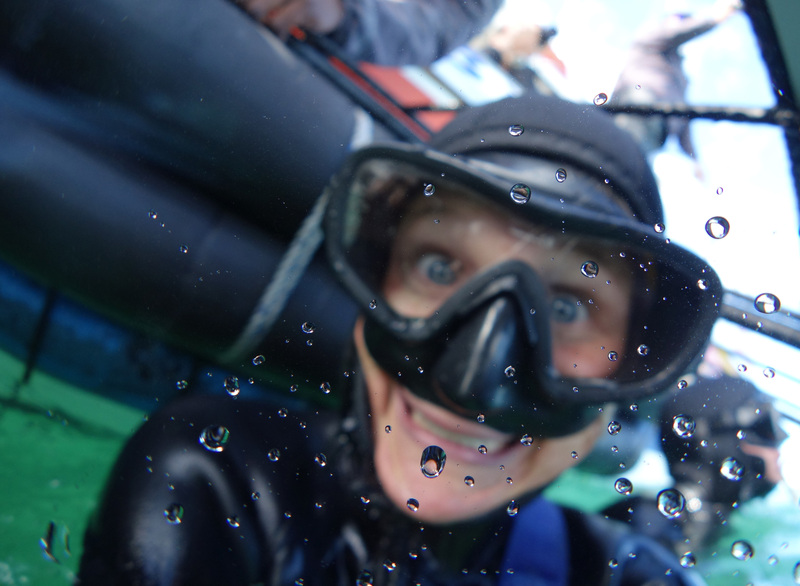 The wet wetsuit sent unwelcome silvers through me, which didn’t improve as I slipped into the cold water. Shark approaching from the right… Divers down. A gray shadow, faint and fleeting. We waited. Here’s a big one. Coming for the bait now. Approaching from the front. Divers get ready. Down. I ducked into the frigid water, held myself away from the outside and strained my eyes again into the green fog. Out of the haze came a big face, familiar yet foreign, right past me, eye to eye with the big man in the gray suit. A few more sharks passed by. I got only glimpses as they pasted in the murk. Marvelous glimpses. Then a set of teeth came into focus. Rows of white pointed triangles, slightly crooked in their rows, jutted out from wide, fiercely pink gums. The teeth moved in fast, until I could make out the whole head, gray on top and white below, interrupted by crisscrossing scars, an intelligent dark eye and those teeth. 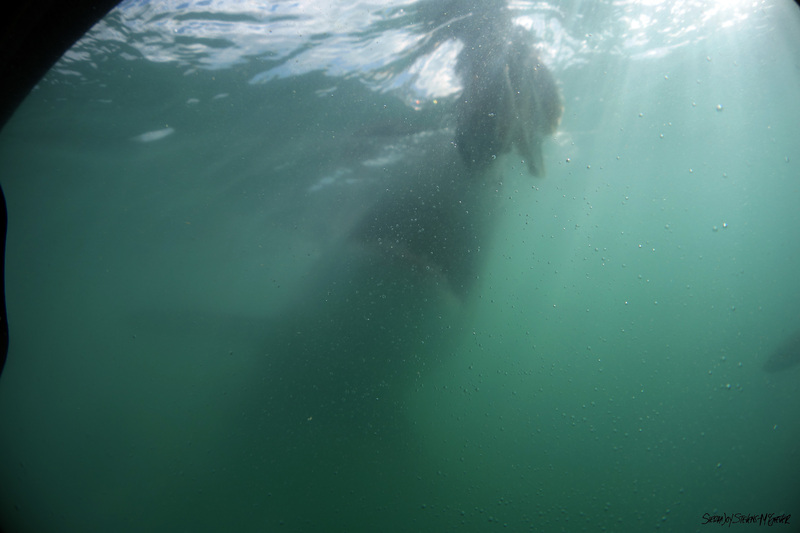 I had seen nothing until I was face to face with the mouth of the white shark and then something else caught me eye. It was the mangled tuna head, ripped unevenly below the gills so the rows of now tattered gill arches wavered behind the head, the protecting operculum mangled and gaping, mouth ajar, and the oversized eye blankly staring at me as it swung in through the bars and hit me on the forehead. The head lingered there as if considering its options. Lanced pulled, but it got stuck and swung back at me. The teeth lingered for a second, then vanished. “How was that?” Lance asked in his thick South African accent, his blue eye crinkling at the sides as he grinned. Big shark. Very big shark, a new one, number 12. Divers down. It came from the right, fast and angled straight at the cage. The intent eye passed inches from mine while its mouth began to open. 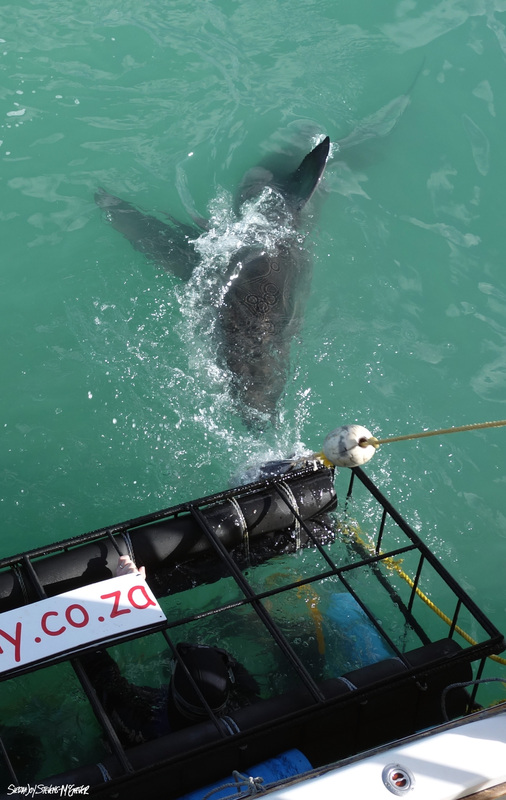 The shark hit the bait in an instant and thrashed violently to the right slamming against the cage with its tail and body. I felt it more than saw it. The impact rocked the cage back against the boat. Water surged over-head and soaked the lower deck. Shouts from above. Dave’s gleeful cry. My hand grasped the bar, white and ridged while I kept my arms carefully straight, pushing myself away from the front of the cage. My lungs burned. A pause of stillness. 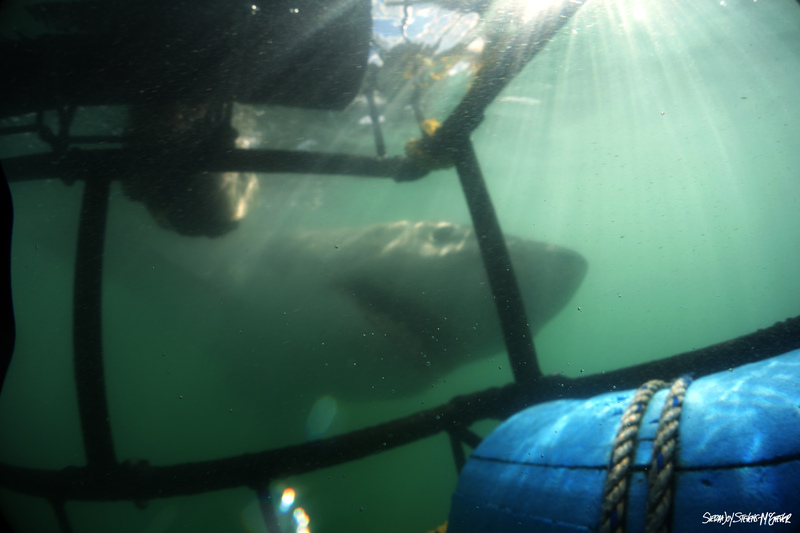 I waited, still feeling the jolt of the shark, adrenaline pumping through me. Number 12 circled around, swam the length of the cage, brushing past us before disappearing into the green. I surfaced to hear Dave cheering. He stood just above me on the boat, ocean water splattered on his green t-shirt. 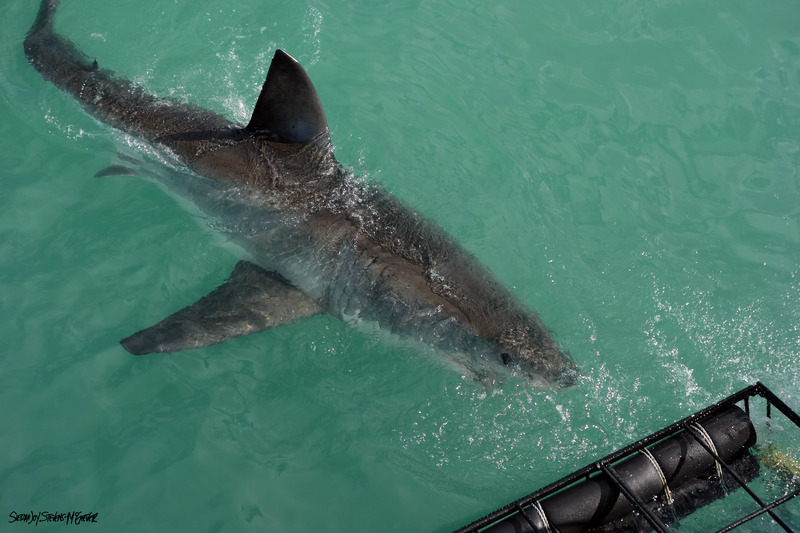 This area has one of the largest concentrations of white sharks. 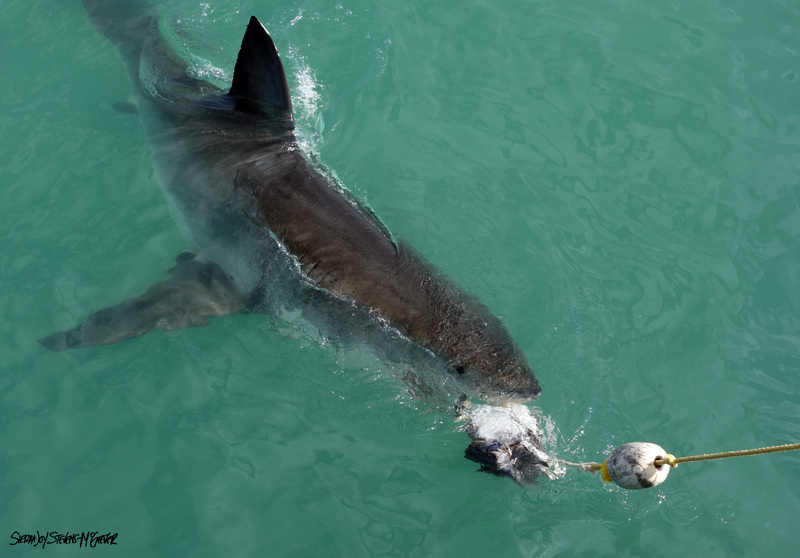 White sharks can reach over 20feet and 7,000lbs and can swim up to 35miles an hour. Water clarity varies with the amount of suspended sediments, nutrients and plankton. The water visibility around the usual shark viewing area at Dyer Island is usually 40-70 feet. Ampullae of Lorenzini are specialized jelly-filled pores on the snouts of sharks that can detect the strength and direction of electric currents, which they can use to hunt and navigate through the open ocean. Species that are long lived usually have low intrinsic rates of population increase and long generation times making these species more susceptible to decline and less able to recover quickly. Male sharks and rays can be easily identified by their two claspers—grooved reproductive organs originating from the inside of the fish’s pelvic fins (located on the lower belly). Although they have two, only one clasper is used at a time. Little is known about white shark mating because it is extremely difficult for scientists to observe. 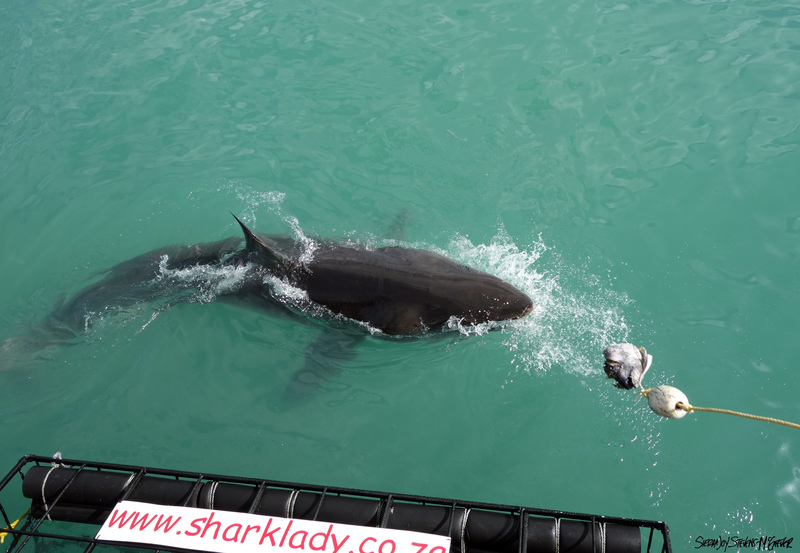 We know that white sharks mate while swimming, the male bites on to the female in order to have enough leverage to insert his clasper. Claspers of many sharks unfold (almost like an umbrella) once inserted to form an anchor while delivering sperm. The white shark is ovoviviparous: fertilization is internal but the young grow in an egg, which is then hatched inside the mother. Like eggs that are laid externally, no additional nutrients are provided by the mother during gestation. White shark teeth are sharp, serrated, modified placoid scales designed to tear prey into bite size chunks. Most sharks have 5 rows of teeth at any given time, when one in front is lost/destroyed another fills its place. Each row of teeth is progressively smaller and teeth develop as they move forward. Over the course of its lifetime a white shark may have >30,000 teeth. ← Ostriches on the Beach? Must be in Cape Town! Fabulous photos, chilling story-you and David rock! Seems even more scary with poor visibility. You both are brave!